Out mid-September from Solaris E-Books is the novella Binary. The second novella in the duology, System, will follow early next year. Together they will form the real, solid, paperback novel Binary System, out from Solaris later year. They’re both available for pre-order now. On what should have been a routine mission to the star system of 61 Cygni A, Delia Kemp finds herself shunted over ten thousand light years through space into an uncharted sector of the galactic arm. The only survivor of a catastrophic starship blow-out, Delia manages to land her life-raft on the inhospitable, ice-bound world of Valinda, populated by a race of hostile aliens, the Skelt. What follows is a break-neck adventure as Delia escapes from the Skelt and travels south through a phantasmagorical landscape as the long winter comes to an end and the short, blistering summer approaches. The Skelt will stop at nothing to obtain Delia’s technical knowledge – but what Delia wants is impossible: to leave Valinda and return to Earth. 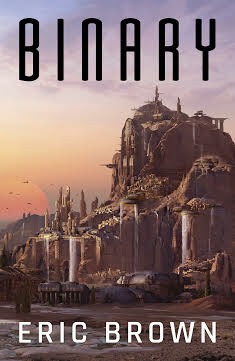 Binary is a thrilling action-adventure novel in the spirit of Jack Vance’s Planet of Adventure series. HI Eric – didn’t even realise this was coming out as I hadn’t heard anything about it! I immediately went to amazon, but no sign, and neither is there anything on the Solaris ebook shop. Any idea what’s happened?! Thanks for this. I was a bit presumptuous in my post! It’s out mid-September, but available for pre-order via the just-uploaded link! Sorry for the confusion. Good read, looking forward to the continuation! Also enjoyed the Werid Space series. Cheers, Rudy. The next Weird Space novel, a solo by Una McCormack, is due out soon. Currently reading and enjoying the Binary System. Have two comments, first is that the novel made me remember Edgar Rice Burrough’s novels. Secondly I felt that the cover art didn’t match up with the story. What are the tubes in the art? But please keep writing and we will keep reading! Thanks for this, and delighted you’ll keep reading. As for the tubes in the cover art… I’m as mystified as you are! Let’s just say that they’d old Skelt technology, shall we?